Nutley Town Hall is located at 149 Chestnut Street, Nutley, NJ 07110; phone: 973-284-4951. Photo: Kingsland Manor, ca. 1780s, 3 Kingsland Road, Nutley, NJ. Listed on the National Register of Historic Places in 1978. Photographed by George Neuschafer, 1941, Historic American Buildings Survey [HABS NJ-150], memory.loc.gov, accessed November, 2013. Nutley derived its name from the large estate of the Satterthwaite family, established in 1844, which stretched along the banks of the Passaic River. In 1902, Franklin, New Jersey, once the northeast corner of Newark, changed its name to Nutley when a growth in population prompted a change in the form of government from Township to Mayor/Council. In 1870, three passenger railroad stations opened in Nutley. They included the Franklin Avenue station on High Street, Nutley station on Highfield Lane and Walnut Street station on Walnut Street. Passenger rail service quickly transformed Nutley into a bedroom community to New York City. As the mills and quarries that historically operated on the Third River and Passaic River closed, homes transitioned to residents, many of whom became New York City commuters. While passenger rail service no longer exists in Nutley, it is responsible for the current land use patterns which exist today. The Township has managed to conserve its natural resources in a distinctly suburban landscape. Nutley boasts an excellent park and recreation system. Nutley maintains over 10,000 trees and over 100 acres of recreational land. No home in Nutley is more than one half mile from a park or playground. The area of New Jersey in which Nutley is located was first inhabited by Native American tribes, referred to as the Lenni-Lenape, who utilized the area for hunting and fishing. Organized around familial associations, small communities of the Lenni-Lenape lived in an area which was filled with wildlife, and pristine rivers and lakes that were stocked with abundant fish. These communities coexisted peacefully with one another, as well as the early white settlers, who began to settle in the area after the arrival of Robert Treat and a group of Puritans from Connecticut in 1666. Nutley's development as a permanent settlement, as opposed to supporting a nomadic subsistent existence, began in the mid-1600s when the Aquackanonk and Newark Patents were granted by Royal Governor Carteret. Farmers who settled in the area along the Raritan River were mostly of Dutch and English descent. Settlement began in the area that is now within the boundaries of the City of Newark and spread outward to include land within Nutley. Homes at the time were built in the style reflecting the settlers' homeland. The Van Giesen House (nee the Vreeland Homestead) is the earliest known (and surviving) house built in Nutley—it stands as the Women's Club on Chestnut Street. Historical records indicate a Newark town meeting being held in the Van Giesen House in 1693. In 1695 John Treat acquired land adjacent to the Van Giesen House, and in 1696 Thomas Stagg purchased another adjacent lot. These transactions signified the beginning of permanent settlement and land development in Nutley. 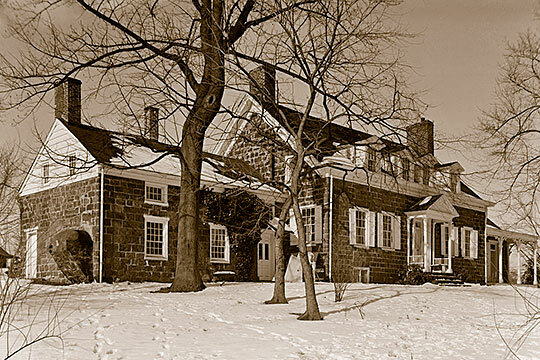 Although it is not known when quarrying began in Nutley, existence of a number of stone houses in the 1700s gives credence to their existence at the time. Reflective of the Dutch architectural influence, many stone houses were built at the time, six of which remain in existence today: Methodist old stone parsonage at 213 Passaic Avenue; Van Riper House (Four Maples) at 491 River Road; Kingsland Manor at 3 Kingsland Street; Vreeland Homestead (or Woman's Club) at 216 Chestnut Street; Abram M. Speer House off Church Street; and the John Mason House at 19 Calico Lane. Initially this area of settlement was considered to be part of Newark. In 1812, the area became a part of Bloomfield which broke off from Newark. In 1839, the area was divided again, forming the communities of Bloomfield and Belleville. By the 1800s, mills were established along the Third River and additional homes were erected to accommodate the mill workers and their families. Clusters of frame houses were built around town dating back to the 1830s, '40s and '50s. Many of these buildings have survived to the present day. Notably, Prospect Street near Church Street has a group of such houses. There are other groups of such homes along Bloomfield Avenue and Vreeland Avenue. In 1868 a railroad connecting Nutley to New York City was constructed and the development of the area as a commuter community began. John and Silas Hay and Ashbel T. Barney developed residential areas on the first ridge around upper Rutgers Place, North Road, Satterthwaite Avenue, Highfield Lane, Nutley Avenue, Chestnut Street, and Grant Avenue called "Nutley Heights." In the valley, an artist's colony called "The Enclosure" was built. These residential areas were built near the Nutley Railroad Station for easy commuting to New York. Meanwhile, in 1875, the northern section of Belleville broke away to become Franklin. By the 1890's, Hay and Barney were joined by William Lambert, who created the Nutley Realty Company, developed "Prospect Heights" on the second ridge near the Franklin Railroad Station and "Terrace Height" on the north of Kingsland Street and along Cathedral Avenue. By the 1900s, Lambert bought out the Barney-Hay real estate holdings and developed "Nutley Park." In 1902, Nutley was incorporated as an independent Township. After World War II, the area now known as Spring Garden was developed to fill the need for housing for returning veterans. While development in the 20th Century led to the destruction of many significant structures, there still remain a number of buildings and districts in which the history of the Township is reflected. Phillips Preiss Grygiel LLC for the Nutley Township Planning Board, Master Plan for the Township of Nutley, Essex County, NJ, 2012, www.nutleynj.org, accessed November, 2013.